Do you love the store bought cinnamon swirl breads, but find that they are too expensive to buy all the time? Not crazy about the ingredients listed on the packaging? I first created this recipe so that it would be easy enough for my oldest daughter, a cinnamon lover, to make. The bread is slightly sweeter than regular white bread and it has an extra cinnamon flavor. 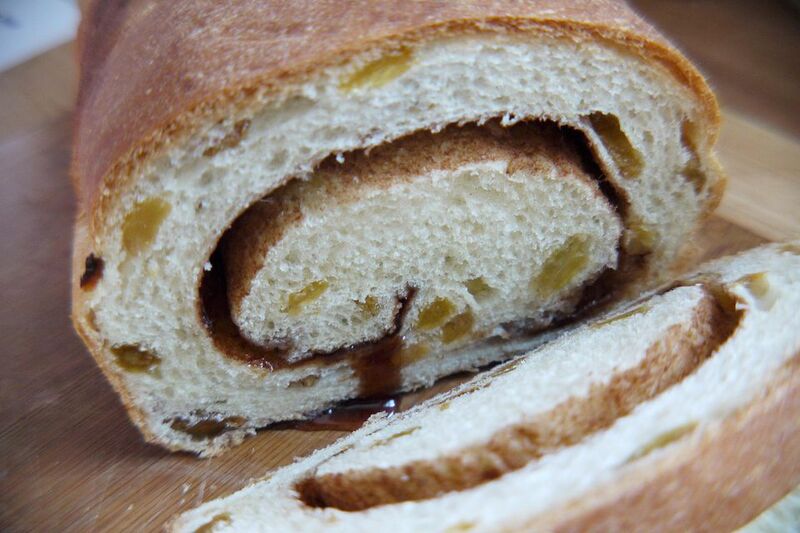 The sugary cinnamon swirl that goes through the middle adds an extra punch to the bread. This 1-loaf recipe makes a great breakfast bread and is a great replacement for pre-made pastries bought in the store. In small saucepan, warm milk and 1 tbsp butter until butter is melted. Set aside until lukewarm. In small bowl, mix water and yeast until yeast is dissolved. In large bowl, add 2 tbsp sugar, salt, and 1 tsp cinnamon. Pour in lukewarm milk and butter. Mix until sugar and salt is dissolved. Stir in yeast and water. Mix in 2-1/2 cups flour. Turn out onto floured board and knead in the remaining half cup of flour or until the dough is soft and smooth. Put dough in greased bowl and turn dough so that the top is greased. Cover and let rise in warm place for about 60 minutes, or until double in size. Punch down dough with your fist. Turn dough out onto floured board and knead for about 1 minute. Roll dough out into a basic rectangular shape. Use a butter knife or fingers to spread 2 tbsp softened butter on the top of rectangular dough. Evenly spread about 2 tbsp sugar and 1 tbsp cinnamon on top of butter. Roll up dough and form into 1 loaf. Put into buttered bread pan. Cover and let rise until double in size, about 30 minutes. Turn out bread and let cool on a rack or dishtowel. Use bottled water instead of tap water to make your breads. Water softeners and chlorinated public water can sometimes kill the yeast needed to make your bread dough rise.